IMPORTANT MESSAGE: This product is BACK IN STOCK! Our Cleanadent Liquid Crystals & Sonic Cleaner were so popular that we sold out, but we have them back in inventory and we’ve taken steps to ensure that we don’t run out again! Dr. B Dental Solutions is happy to offer the Sonic Cleaner at 50% OFF with every purchase of Cleanadent Crystals! 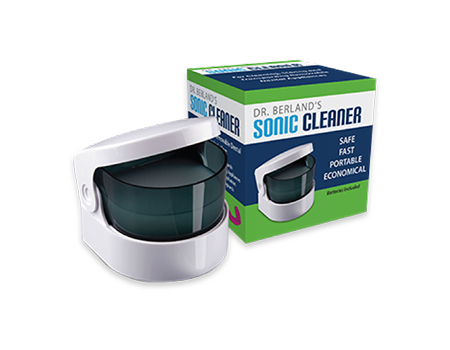 Dr. Berland’s Sonic Cleaner uses high-frequency sonic waves to loosen debris on oral appliances at a microscopic level. The Sonic Cleaner must be used with a soak cleanser, like Cleanadent Crystals, in order to fully disinfect, remove stains and completely eliminate odor. Cleanadent Liquid Crystals is the only soak cleanser that kills pathogens like Candida, Strep, Staph and Actinomyces which are prevalent on oral appliances and cause diseases like Oral Thrush and Denture Stomatitis. The Liquid Crystals is a concentrated liquid soak cleanser that comes in a unique & easy to use Pump Bottle that squirts just the right amount for use with the Sonic Cleaner. Though the Sonic Cleaner by itself does not disinfect appliances, when used with Cleanadent Crystals it can kill pathogens, remove stains and eliminate odor in ways that brushing cannot. This is because regular toothbrushes and toothpaste are too abrasive and will actually damage oral appliances. However, we have Cleanadent Paste which when used with an extra-soft toothbrush is gentle enough to be safe for dentures and is excellent at removing adhesive from the denture and gums. Visit our Cleaning Tips page for more detailed instructions. Dr. Berland’s Sonic Cleaner is ideal for Dentures, Partial Dentures, Mouth/Night Guards, Retainers, Aligners and Sleep Apnea Devices. For Overnight Storage we recommend placing the oral appliance in the Sonic Cleaner with plain water and the position on “OFF”. Never use a regular toothbrush and regular toothpaste on your appliance as it is too abrasive and will cause scratches that reduce shine and color and create the perfect environment for bacteria to thrive.